"Puppy dog eyes" — the pleading look a dog gives by lifting its inner brow and widening its eyes — has become synonymous with a sad pup hoping for a scrap of food off its owner's plate. However a new study published Thursday in Scientific Reports suggests "puppy dog eyes" may not be meant to be manipulative, but are simply a reaction to human expression. Key findings: The study, conducted by researchers in Britain who closely monitored dogs' facial expressions, found that dogs were much more expressive when a person was paying attention to them as opposed to when they were turned away. The presence of food didn't make a difference in the dogs' reactions. 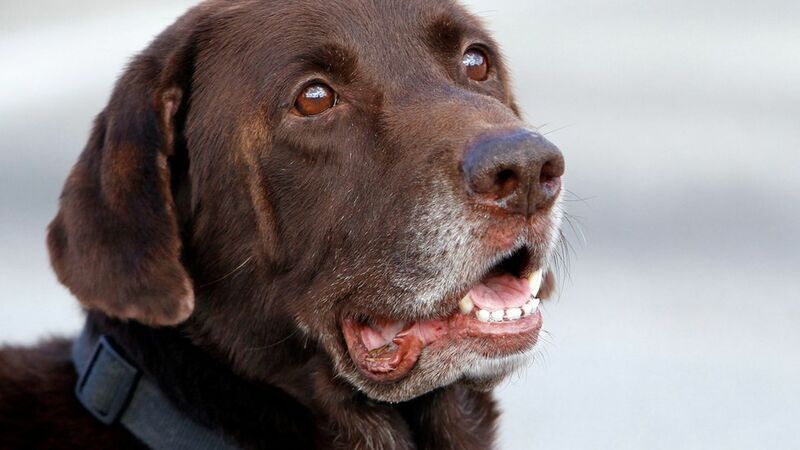 Why it matters: "This study is the first to show evidence that dogs adjust their facial expressions when humans are looking at them," Angie Johnston, a graduate student at Yale university working in the Psychology Department's Canine Cognition Center, told Axios. "This suggests that the methods dogs use to communicate with us may be more nuanced than we previously thought." Juliane Kaminski, a psychologist at the Dog Cognition Centre at the University of Portsmouth, U.K. and her colleagues studied 24 pet dogs of various breeds from ages 1-12 years. The researchers filmed the dogs' facial expressions while a woman was a) facing the dog and displaying food in her hands; b) facing it and not displaying food; c) facing away and displaying food; and d) facing away and not displaying food. The dogs were found to be much more expressive when the woman was facing them, and stuck out their tongues and barked more when they got attention. Meanwhile, the presence of food didn't seem to make a difference. "This kind of 'dinner table effect' that dogs try and look super cute when they want something is something we did in fact not find," wrote Kaminski, "meaning, there was no effect of food being visible or not." Take note: Kaminiski underscored that the team doesn't know dogs' intentions for making certain faces. "We cannot in any way speculate what dogs might 'mean' with whatever facial movement they produce," she wrote. "That the dogs raised their eyebrows and flicked their tongues more when people are looking at them... suggests that dogs might be using the actions communicatively, just as people do with facial expressions," Alexandra Horowitz from Barnard University's Dog Cognition Lab told Axios. Looking forward: "This study represents a promising new frontier in canine science... I was surprised that dogs made 'puppy dog eyes' at the person regardless of whether she had food in her hands or not. This makes me wonder exactly what it is that dogs are trying to communicate," says Johnston. "More work is going to be needed to pin down exactly what dogs are trying to tell us, if anything, when they make these facial expressions."